A new hero, a new mission: meet CHERUB's latest recruit. Twelve-year-old Ryan is CHERUB's newest recruit. He's got his first mission: infiltrating the billion-dollar Aramov criminal empire. But he's got no idea that this routine job will lead him into an explosive adventure involving drug smugglers, illegal immigrants and human trafficking, or that his first mission will turn into one of the biggest in CHERUB's history. Born on December 26th 1972 in Tufnell Park, North London. I was the youngest of four kids. Del was a typical big brother (sometimes a complete git, sometimes my best friend…). My big sister Jenny was my favourite because she was sixteen years older than me and used to buy me Lego sets. My other sister Diane left home when I was two, so I don't have any childhood memories of her. My first school was St Johns Upper Holloway. We had lessons in different kinds of stuff. There were kids I liked and kids I didn't and yada, yada, yada. Mauled by escaped panda at London Zoo… actually that's a total lie. But when I got to year seven I did change schools to Acland Burghley (www.aclandburghley.camden.sch.uk). The best bit of school was years eight and nine when my school closed down to have asbestos removed and we all had to get coaches to another school for two years. At the same time all the teachers kept going on strike. The combination of strikes, traffic jams and coaches not turning up was manic and we got about two days of school per week. Instead of school I'd spend all day hanging around houses trying to set high scores on our state-of-the-art Atari VCS games consoles. By 14 I'd decided to either be an architect, a photographer or a writer. When I looked in the careers guide and saw that it took seven years of training to become an architect I thought 'bugger that' and concentrated on the other two. I got my first Saturday job working in a Jessops Camera Shop. This put me off photography, so I saved up my wages to buy a word processor on which to write my first novel. I bought my word processor. Unfortunately everything I wrote sucked, so I gave up after three months and settled on being an unemployable bum. After two years of messing around doing no work at school I emerged with a grade D A-level in Economics. I spent summer dossing around the house until my dad said he'd kick my lazy arse out if I didn't get a job. After being turned down by Marks & Spencer, The Financial Times post room and the Diplomatic Service I got myself a job as an office junior with a firm of private investigators. 1. I had a mutant spider baby with a former Eastenders star. 2. I won a big Hot Dog Eating competition. 3. I hit a casino jackpot, married a stripper, then lost my fortune in bitter divorce. Still working as a private investigator, which wasn't nearly as interesting as it sounds. I took two months off to visit my sister in Australia and found my twelve-year-old nephew moaning that he couldn't find any interesting stuff to read. I started wondering if there was a gap in the market for a children's book that my nephew would like. I began writing a book with the uninspiring title KN1 (Kids Novel 1). This eventually became The Recruit, but it was more violent. In the original opening James went psycho and slashed Samantha Jennings' face open with broken glass! Early in the year I finished writing the book - now entitled CHERUB 1.0 - but sat on it until summer time before deciding that it was good enough to send to a literary agent. The first agent rejected the book, but the second one I approached took me on. My agent printed off nine copies and sent it to all the major children's publishers. Over the months that followed we got a bunch of rejections. I guess it doesn't take a genius to work out that one of the publishers eventually said yes. 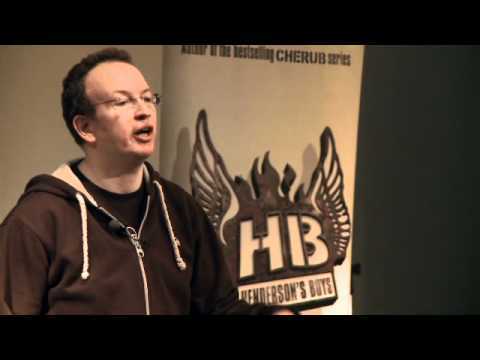 In March 2003 Hodder Children's Books purchased CHERUB 1.0 (Later renamed CHERUB: The Recruit) and an unwritten sequel, both for publication in 2004. CHERUB: The Recruit was published in April and pretty much nobody noticed. But the first CHERUB fans seemed to like it and the book sold quite well for a first novel. In October Class A came out. It got a good reaction from fans, but it sold more slowly than The Recruit and I started getting seriously worried. Meanwhile I was still working a full time job and spent every spare minute writing Maximum Security and The Killing. CHERUB finally started to take off with the release of Maximum Security. The Recruit won the Red House award and several others and CHERUB was published in Germany. By the middle of the year I was knackered from two years of writing and working. When growing book sales coincided with me throwing a box of wet wipes at my boss and calling him a very rude name, I finally quit as a private investigator to write full time. The first two titles in the Henderson's Boys series were published in the UK. I experimented with briefs, but went back to boxers a few weeks later because they chafed my nuts. CHERUB is now published in 26 countries, with over 3 million copies sold, so I've got loads of money. I'm currently working on more Henderson's Boys books and a new top secret new project which will be unveiled at the back of Shadow Wave.